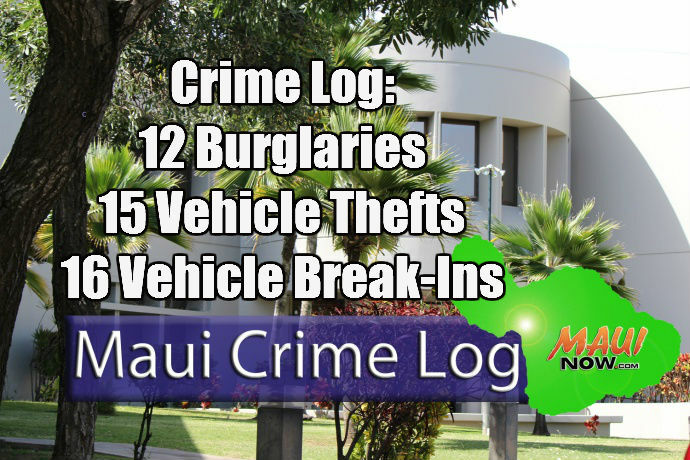 Crime Log for May 14-20, 2017. 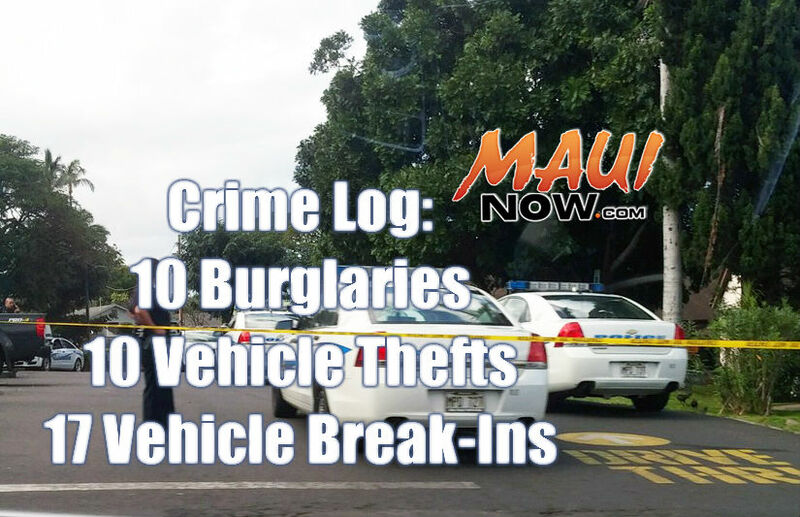 Maui police responded to 12 burglaries, 13 vehicle thefts and 16 vehicle break-ins in Maui County over a seven day period from May 14-20, 2017. Burglaries were down 7.7%, with 12 incidents reported over the seven day period, down from the 13 burglaries reported the week before. 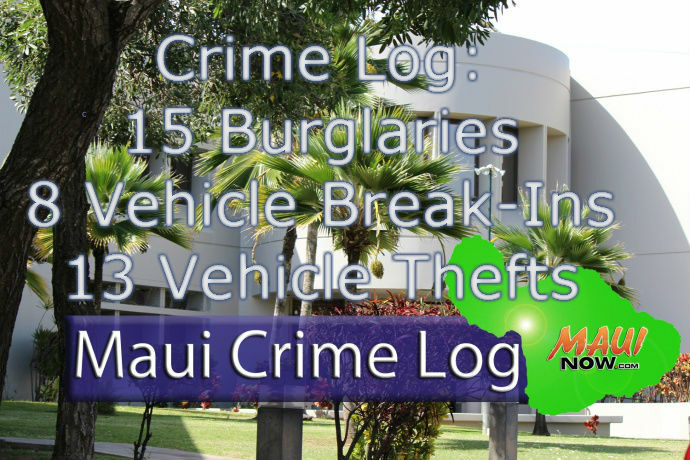 Vehicle thefts were down 50% from the week before when 26 incidents were reported; and vehicle break-ins were up 23% from the 13 break-ins reported last week. 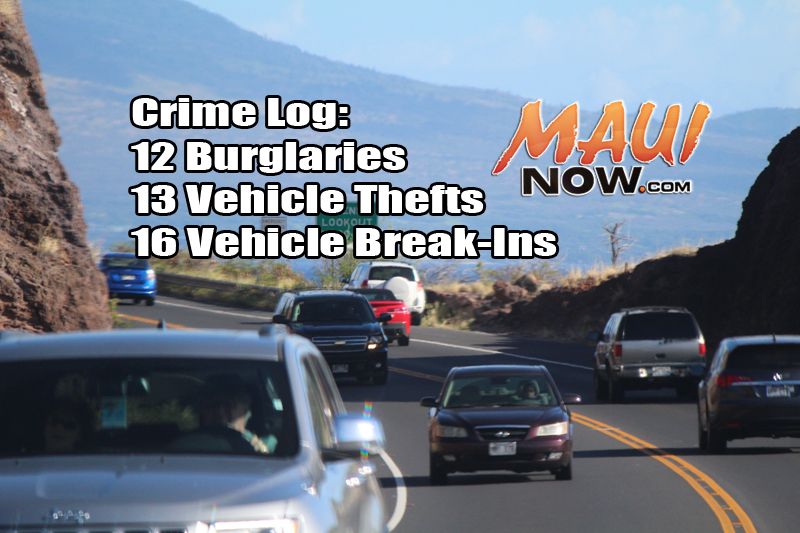 Of the 13 vehicles reported stolen, nine have since been recovered. Monday, May 15, 5:52 p.m.: 100 block of Uwapo Rd. MPW919, 2000 green Honda Civic. RECOVERED. Tuesday, May 16, 6:38 a.m.: 100 block of Uwapo Rd. 580MVS, 2017 black and gray Honda Motorcycle. RECOVERED. Tuesday, May 16, 1:21 p.m.: 1900 block of South Kīhei Rd. LER282, 1970 yellow Volkswagen Pickup. RECOVERED. Thursday, May 18, 7:24 a.m.: 100 block of Uwapo Rd. 116MVP, 2000 red Honda Motorcycle. RECOVERED. Thursday, May 18, 6:40 a.m.: 100 block of Uwapo Rd. 946MVR, 2006 Suzuki black Motorcycle. RECOVERED. 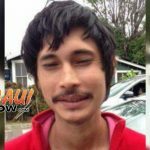 Sunday, May 14, 7:45 P.M.: 600 block of Honoapiʻilani Hwy. M87368, 2013 black Genuine Moped. RECOVERED. 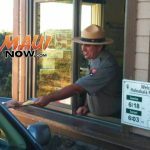 Monday, May 15, 9:03 a.m.: 888 Front St at Foodland Lahaina. 177MDC, 2006 white Ford Ranger. RECOVERED. Saturday, May 20, 6:21 p.m.: Front St / Prison St at Prison Street Parking Lot. GTT195, 1998 white Honda Civic. RECOVERED. Wednesday, May 17, 11:43 p.m.: Makawao Ave at Makawao Municipal Parking Lot. GXJ033, 1998 silver Honda CRV. RECOVERED.